In working to keep the audience off-center...Desplechin artfully makes the well-worn family-weekend plot endearing again. 152 min. IFC Films. Director: Arnaud Desplechin. Cast: Catherine Deneuve, Mathieu Amalric, Melvil Poupaud, Chiara Mastroianni, Anne Consigny. French writer-director Arnaud Desplechin is given to expansive domestic dramedies. Apart from 2007's relatively compact autobiographical documentary L'Aimée, about the sale of Desplechin's family home, there was 2004's Kings & Queen (Rois et reine), in which a daughter seeks to come to terms with her terminally ill father while the father of her son finds himself interned in a mental hospital against his will. 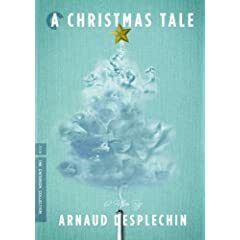 During the film's two and a half hours, family secrets emerge; the same could be said of Desplechin's seriocomic new film A Christmas Tale (Un conte de Noël:Roubaix!! ), co-written with Emmanuel Bourdieu, and starring Mathieu Almaric and Catherine Deneuve (both of Kings & Queen). Almaric (currently bedeviling James Bond in Quantum of Solace) plays Henri, bane of the Vuillard family. A mercurial, alcoholic widower with a history of mental illness, Henri is described by his playwright sister Elizabeth (Anne Consigny) as "like the devil. Ordinary, twisted. He's banal...Henri is predictable, like evil." He may also be the best hope of their mother Junon (Deneuve), who has been recently diagnosed with myelodysplasia, a.k.a. leukemia. With the Christmas holiday approaching, the family sets to testing their bone marrow compatibility and anticipates a strained family reunion. Also in the mix: Henri and Elizabeth's younger brother Ivan (Melvil Poupaud of Time to Leave), the shy peacemaker with a wife (Chiara Mastroianni) and two kids; cousin Simon (Laurent Capelluto), a lovesick painter; Elizabeth's sixteen-year-old son Paul (Emile Berling)—cursed with the Joycean surname Dedalus—sprung from the psych ward for the holidays (and blood testing); patriarch Abel (Jean-Paul Roussillon); and Henri's surprisingly sanguine girlfriend Faunia (Emmanuelle Devos). A fourth Vuillard sibling also hangs over the proceedings, eldest brother Joseph, who died, at age seven, from the same disease plaguing Junon. Having failed to save Joseph, it is in the nature of this family to second guess each move and pass around familial baggage. The mulling over Junon's medical options considers differing perspectives on the disease and its potential consequences: emotional, practical, mythical, even statistical (offered by Elizabeth's mathematician husband). Expanding on the theme of individual perspectives, Desplechin offers many a character the opportunities to deliver, directly to the audience, a monologue composed of the poetry of the troubled mind. Sylvia: A family of weirdos. Ivan: Not at all. We're ordinary people. Sylvia: Exactly. You claim to be ordinary...The Vuillards pretend they're normal and they're not. That's weird. Except that it isn't. The siblings are all pegged as melancholy (Ivan claims to be "constantly unhappy," Abel has called his son "Henri Misery" since childhood, and Elizabeth asks, "Why am I always unhappy?"). Henri may refuse to own up to his past lapse in judgement, but it's Elizabeth who clings to her resentment like a badge of honor, having banished Henri from her life for the last six years. Can this family be saved? It's the elephant in the room, or perhaps we should say the wolf in the cellar. The invisible beast, named Anatole, is an aging imaginary threat to the household's past and present children. For a family on the edge of madness, the solution is simple: stop believing the wolf is at the door and start believing in each other. 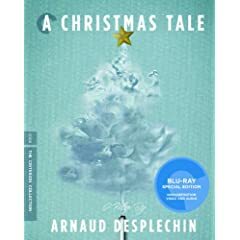 What's immediately striking about Criterion's Blu-ray edition of Arnaud Desplechin's A Christmas Tale is the richness of the color. Of course, the textured transfer also excels in detail and contrast, all while maintaining a natural, film-like appearance. It's a typically strong showing from Criterion, which specializes in director-approved transfers (and, yes, Desplechin checked off on this one). Though the domestic comedy-drama doesn't give much occasion for bringing the surround channels to life, the film nevertheless gets an excellent, lossless DTS-HD Master Audio 5.1 mix that crisply presents the original audio elements in the original French language, with optional subtitles. True to form, the disc also includes useful context in the form of carefully selected bonus materials. Desplechin's fascinating, bittersweet 2007 documentary "L'aimée" (1:06:04, HD) recounts the sale of his family home but also, unexpectedly, "his father's impressions of the mother he never knew." It's a highly personal work, both idiosyncratic and lovely in style, and it anticipates the ideas on the filmmaker's mind that he would revisit shortly thereafter with A Christmas Tale. "Arnaud's Tale" (35:58, HD) is a brand-new documentary, exclusive to the Criterion Collection, that features interviews with Desplechin, Catherine Deneuve and Mathieu Amalric about the making of the film, its themes, and their respective involvement. The "Original Trailer" (1:58, HD) and the "American Release Trailer" (2:20, HD) are here, and as usual, Criterion's handsome packaging includes a lovely full-color booklet, this one a sixteen-pager featuring an essay by film critic Phillip Lopate (along with the customary chapter list, credits, and tech specs). All site content © 2000-2019 Peter Canavese. Page generated at 04/25/2019 03:04:12PM.